This one’s an old favourite in my family. We call it “Dad’s” because he’s the one who makes it (he’s pretty darn good in the kitchen! ), but he actually got the recipe out of a very old Woman’s Weekly cookbook. 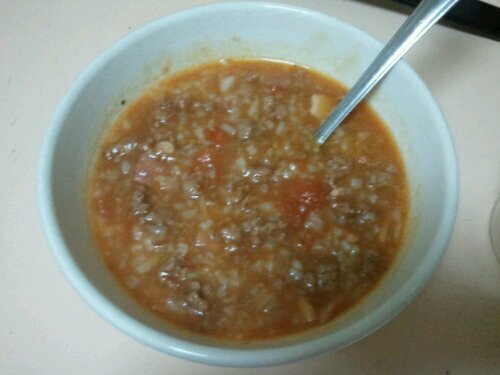 Cook rice in 2 1/2 cups boiling salted water until tender. Do not drain. Saute meats together until browned, breaking up mince with a fork. Add to cooked rice with 2 cups of water. Mix well. Season with salt and pepper. Add stock cubes and onion and bring to the boil. Reduce heat, cover and simmer for 45mins. Add tomatoes and simmer for a further 15mins. I often use a can of diced tomatoes instead of fresh – it tastes just as good and I always have canned tomatoes. You can add small diced vegetables such as potato, sweet potato or others if you like.